Stainless steel tables are durable and attractive. Many people incorporate stainless steel in their kitchens, either on their countertops or a kitchen island, because of it's durability. And it matches your stainless steel appliances beautifully. 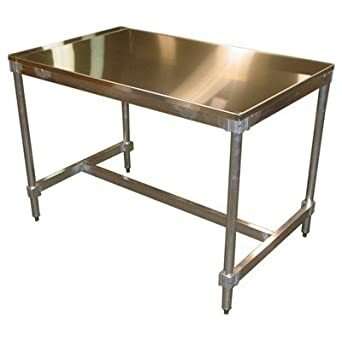 Restaurants typically use stainless steel prep tables, and other areas, because personnel can cut foods right on the surface, and the tables/countertops are easy to clean and disinfect, too. Stainless steel can take abuse from just about any kitchen utensil or hot pot, and scratches and marks offer a warm, lived-in look that will go down in time. Like stainless steel appliances, stainless steel tables and countertops are popular because they work well in both traditional and contemporary kitchens. Stainless steel tables are also popular in garages as workbenches, and with sportsmen cleaning their catch of the day. You can use them anywhere you need extra work space. For craft rooms, too! Approved by the National Sanitation Foundation, and the U.S. Department of Agriculture. 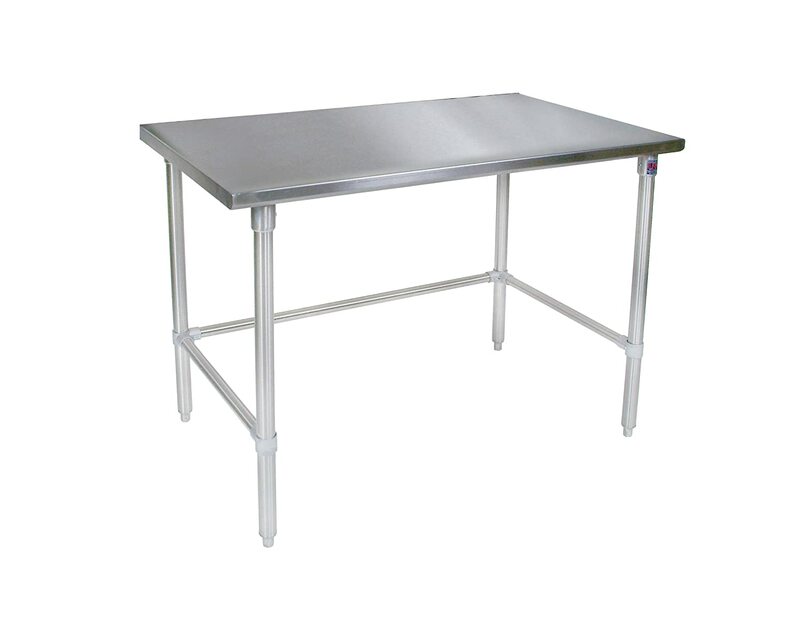 This quality stainless steel table can be used at home or in any professional restaurant. B-Tec preparation and mixing table provides efficient organization at the work place, or at home. Durable construction and drainage facilities. Large storage/working areas made of stainless steel and galvanized steel. Four holders for spray guns and one holder for paper rolls. Strong magnetic bar. Measures 61-inches length by 24-inches width by 55-1/2-inches height. Use a cleaner with a high alcohol content that dries quickly and does not leave a film. Sterilize or disinfect before food touches the table. Buff scratches with a scouring pad, following the grain of the metal. Spray liberally with vinegar to remove any stubborn water spots or finger prints, then wipe with a soft, dry cloth. Buy a stainless steel cleaner, but make sure you disinfect the surface before food touches it. Wipe down the surface. Do a mild scrub by using baking soda and vinegar then scrubbing with a non-abrasive nylon scrubbie or scrub brush. Scrub the countertop gently in the direction of the grain. Rinse thoroughly with a clean, damp dish cloth. Use a mild dish detergent for everyday cleaning purposes. Make sure you rinse soap off completely with a clean, wet cloth. This John Boos work table comes with a thick, sturdy 16 gauge stainless steel top. The base’s bracing and under shelf are composed of 16 gauge galvanized steel so that these work tables are as sturdy as they are stylish. These tables come with adjustable bullet feet for use on uneven surfaces and are perfect for use in commercial, institutional – and even residential – kitchens. 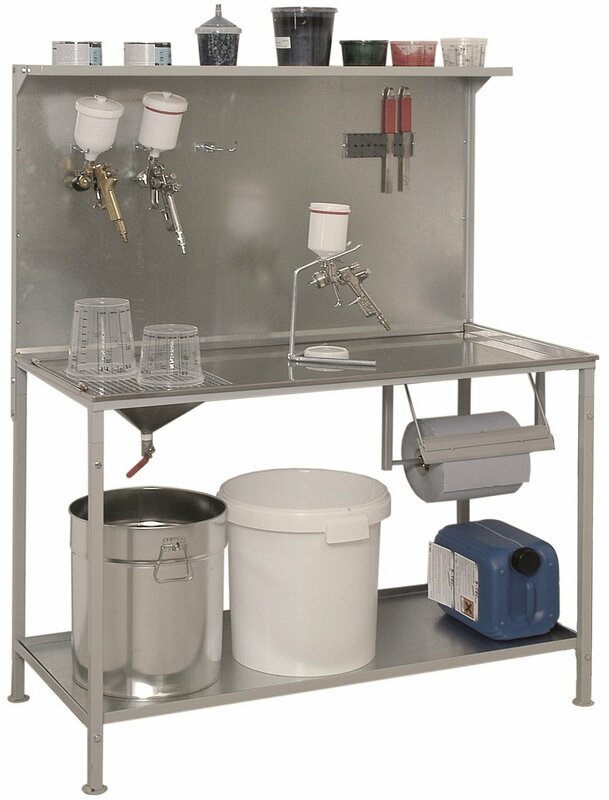 This table is built to comply with the National Sanitation Foundation NSF/ANSI Stand 2 for food equipment. It ships knocked down, but is easy to assemble. Tools for assembly are sold separately. 48" x 24". 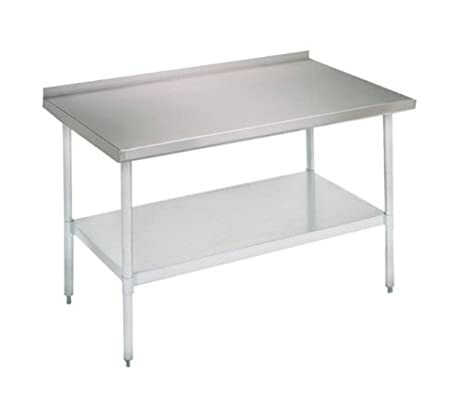 John Boos ST6-3648SSK 16 gauge Stainless Steel Work Table with Stainless Steel Base and Shelf, 48" x 36"
This stainless steel worktable has a curved edge surface for safety and comfort. The worktable incorporates leveling feet. Suitable for a variety of food preparation works in a commercial kitchen. This product features easy assembling or disassembling. It is constructed of an 18 gauge type 430 stainless steel flat top. 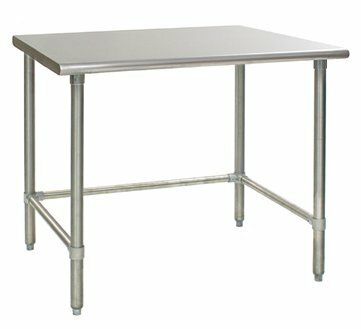 This work table has galvanized legs with adjustable 1 inch plastic bullet feet, galvanized socket, under shelf and hat channel with removable galvanized cross bar. Free Shipping Within Continental United States!